This game is a mashup of two games: one I started for Game Chef 2006 and the other I made for the Make Game$ Fast Contest. 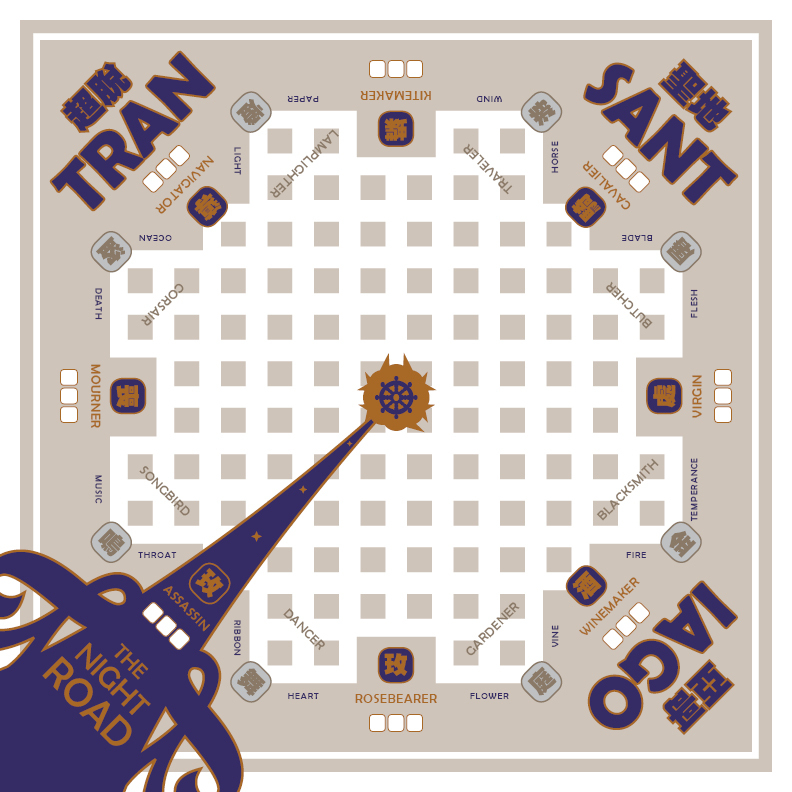 The result, Transantiago, is directly inspired by Italo Calvino’s Invisible Cities, “The Line” (a Primetime Adventures series created by Brandon Amancio, Tony Dowler, John Harper, and Phil LaRose), too much time spent researching Chinese cults, the game design work of Shreyas Sampat, minimalist music, and the metro systems of Washington DC, London, Beijing, Hong Kong, and Santiago (the latter of which I have never experienced). Thanks to my initial playtest group from the November 2007 JiffyCon: Shreyas, Elizabeth, Emily, Rachel, John, and Casey. This is not a complete, playable draft, but hopefully it will be soon. The elevator pitch of Transantiago is “bodhisattvas on the subway at the end of the world.” The players take on the roles of eight Buddhist saints, Those Who Tarry at the Door, at the twilight of this world of suffering. The eight bodhisattvas seek to unfetter the metro stations of the mirrored city, Transantiago, by resolving the lingering issues tying them to this world. In the process, they also unmask eight hidden bodhisattvas, Those Who Come in the Night, and outwit the demonic asuras who pose as hidden bodhisattvas. When the Buddha was on his deathbed, a group of children came to him and asked: “Teacher, why is there a Santiago in Chile, a Santiago in Cuba, yet another Santiago in the Philippines, a Santiago in California (though that one’s called San Diego), thirty Santiagos in Portugal, five in Spain, and one in the Galapagos?” But by the time the children finished their question, the Buddha had died. The game is for eight players, who, in the beginning, represent Those Who Tarry at the Door, a.k.a. The Petals of the World-Flower, a.ka. the eight doomed Bodhisattva. They are enlightened individuals who have chosen to return to the world of suffering even though the future age is near at hand. The cusp of the Age-To-Come, the Fifth Age, is at hand and all souls who will realize their buddha-nature have proceeded to the Pure Land in preparation for the Great Blossoming. Even the other bodhisattvas — Avalokiteśvara, Ksitigarbha, Mahasthamaprapta, and the rest — have all proceeded on. Those Who Tarry at the Door will be trapped in the ashes of this world’s destruction and will not escape to enjoy the salvation of the Pure Land. They have made this sacrifice because they are the ones who must seek out Those Who Come in the Night, a.k.a. The Seeds of the Blossoming Flower, a.k.a. the eight emergant Buddha-to-be, who will, in their unity, bring about the next age. Once these eight souls are unmasked, they will come forward, step through The Door, and close it behind them. And then the Age-To-Come will have come. But Those Who Tarry at the Door will not be there to see it. They will perish with the rest of the imperfect world. However, without the sacrifice made by Those Who Tarry at the Door, Those Who Come in the Night will never step forward, and the Age-To-Come will not come. Each of Those Who Tarry at the Door embodies the convergence of two universal themes. Each of Those Who Come in the Night embodies the convergence of two themes drawn from different members of Those Who Tarry at the Door. The themes and their respective entities are listed below, with Those Who Tarry at the Door in bold. The beings who are not bold are Those Who Come in the Night. Unlike Those Who Tarry at the Door, Those Who Come in the Night are not portrayed by a single player. Instead, the Buddha-to-be are jointly controlled by the players of the adjacent Bodhisattva. So, you start off playing one character and end up playing half of two characters. After all, you are not really The Corsair; she is just a representation of your dual inner nature. You are really Death & the Ocean and will continue to play Death & the Ocean once The Corsair is no more and there is only The Mourner and The Navigator. While each Bodhisattva is an authority on the Buddha-to-Be that they are personally tasked with finding (those on either side of them in the Mandala), it is the nature of this searching that each Bodhisattva will inevitably find candidates that fit the requirements of their fellows and not their own requirements. So play will also consist of recommending potential souls to the other Bodhisattvas and then working together to determine whether they are, in fact, likely candidates for Those Who Come in the Night. Those Who Tarry at the Door and Those Who Come in the Night are not “player characters” in the traditional sense: they have no defined attributes, skills, or other traits, their physical features should not be described before or during play, and they have no possessions (aside from things they acquire in the metro). No bodhisattva can be recognized for what they look like or any other quality aside from the things they do during the game. If a bodhisattva helps an old lady find her missing purse, the old lady might call the avatar “that kind person” or remark that “you’re the one who found my purse,” but that’s all. The events of play take place entirely within the metro. The rest of the world has already proceeded through The Door or has been burnt to ashes. For certain, Those Who Tarry at the Door are not perfect or infallible. Being enlightened does not prevent them from spending much of their time chasing souls who will not end up being relevant to their search. However, those futile attempts are not what this game is about. Like a good police drama, if a piece of evidence emerges in play, you can be certain that it will somehow matter to the final outcome, even if it is in a way that few would expect. This is not a game about how the bodhisattvas overcome failure after failure to find Those Who Come in the Night. Instead, it is a game about the true results of their searching, about how they will, in the end, find who they were looking for. Because this game tells of the bodhisattvas’ successes, this does not mean that it ignores the many traps laid for them by the evil powers of the world. The Asuras and some misguided Devas do not wish to be left behind when the present age ends. In an effort to earn themselves a place in the Pure Land and the Age-To-Come, several of them have worked for centuries to disguise their supernatural nature. By placing themselves in the path of Those Who Tarry at the Door, these treacherous creatures hope to be appointed to the ranks of the Those Who Come in the Night. Of course, their attempt is doomed to failure, for Those Who Tarry will indeed uncover their treachery before the final eight step forward from the ranks of likely candidates. But the efforts of the bodhisattvas to uncover the Asuras’ falsehood is part of the story of their success and, therefore, it is only proper that these events are part of the game. What can we say of the experiences of bodhisattvas that would not simply be a metaphor? How can the mortal mind possibly comprehend the sensory powers of those for whom the past and future can be experienced as readily as the present? Where and when are Those Who Tarry involved in their conversations and searches? Are they clustered around the door to the Pure Land, whispering amongst themselves and identifying their proteges as Those Who Come step forward one by one? Or are they simply engaging in brief conversations in wayside huts as they pass one another, engaged in their searching across time and space? We do not know. We cannot say for certain. But we can enact these conversations and see what transpired between them. Do the place and time truly matter? Not particularly. Whether the eight hours of game time passed, in reality, all in one moment or spread out over the course of humanity’s 55,000 years, they happened all the same. And that is enough. Suffice it to say, the players responsible for representing Those Who Tarry at the Door need not imagine themselves in any particular environment or circumstances, but are free to do so if it helps. Spread the Mandala out on a reasonably flat surface, put on a pot of tea, and cue the music. Everything else will take care of itself. If you wanna pull out the fancy robes and play WTF as a full-on 8-hour larp, be my guest, but I’m imagining a more casual play experience, which allows players to focus on speaking and listening. Once play begins, the conversations among the eight bodhisattvas should flow freely, whether in pairs, in small clusters, or, on occasion, with the whole group meeting to hear evidence or make decisions as a commitee. However, each individual bodhisattva can only move forward in their efforts to unmask Those Who Come in the Night not by speaking, but by listening. Play consists of the bodhisattvas describing (to at least one other bodhisattva) circumstances they they experienced while traveling through their native Age, circumstances which may indicate the presence of one of Those Who Come in the Night. Because this game only tells of the bodhisattvas’ successes, the circumstances described will inevitably lead to either 1) finding one of Those Who Come, or, 2) uncovering an Asura attempting to fool Those Who Tarry. Note that this does NOT mean that any candidate suggested by a fellow bodhisattva must be an Asura or one of Those Who Come, just that the evidence provided must EVENTUALLY lead to one or the other. An obvious answer is rarely the correct one, in this case. Notice, as well, that even if a candidate will eventually prove to be one of Those Who Come in the Night, he or she is not necessarily either of the two of Those Who Come that any given listener is tasked with finding. For instance, the Corsair could tell the Traveler about a candidate who might end up being the Wine-Maker. It takes great diligence on the part of Those Who Tarry, then, for the proper candidates to eventually gain the attention of those who seek them. And only the listener can determine if they are indeed hearing of the one they seek. If the listener is to recognize the soul they seek by its similarity to the listener’s own self, how then can a bodhisattva’s fellows best assist in finding such a soul, if they themselves lack those experiences whose similarity is the only true measure of likelihood? Actually, there are several possible approaches. What may not be obvious is that, since each bodhisattva’s own experiences are not described in detail before play begins, the process of play determines the nature of Those Who Come in the Night by having the players make choices about who Those Who Tarry at the Door actually are. Initially, the only guidelines the players have are the two elements assigned to each bodhisattva. As an example, let us consider the Blacksmith, who is really Temperence & Fire. It is the Blacksmith’s responsibility to find the souls that will become the Virgin and the Wine-Maker, even though he knows little of Flesh or the Vine. This may not seem like enough information to create a well-rounded character out of, but, in the process of considering evidence presented by the other bodhisattvas, the Blacksmith’s player determines the past experiences of his own character. When another player describes experiences and circumstances that they have encountered while searching though their own native Age, it is the responsibility of the listening players to determine which aspects of the narrated situations are in harmony with the experiences of their own character. For example, if The Dancer comes to the Blacksmith and describes encountering an old man whose rooster would crow at the exact stroke of midnight, when there was not a glimmer of light to be seen, the Blacksmith’s player needs to decide if the Blacksmith has ever had a similar experience, such as once meeting a fairy-child who was blind during the day but could see perfectly well in total darkness. In these cirumstances, then, it is the responsibility of the teller to describe situations that are interesting and to the liking of the listening player, such that they will want to invent similar experiences for their own character to have. If they begin imagining connections, you know you are on the right track as a teller. This is the establishment of similarities through listening. Finding the similarities between unusual circumstances and the experiences of your brother and sister bodhisattvas is rarely that easy. You may be recounting your evidence to the wrong bodhisattva. They may be so caught up in their own searching that they initially fail to recognize crucial evidence when it is presented before them. Or you may be focusing on the strangeness of the old man’s rooster when it is the old man himself that is more likely to assist in your companion’s search. This is the establishment of similarities through questioning. There is yet another possibility that occasionally emerges from play, which is where the listener actually sees themselves in the teller’s narrative. While the bodhisattvas may have achieved enlightenment in their "native Age," they have existed since the beginning and have been continually reincarnated since their enlightenment in an effort to teach and free others from the cycle. So, if the teller has discovered a situation that reminds them of one of their fellow bodhisattvas, there is the possibility that that particular bodhisattva was actually present for that specific situation. Maybe the Blacksmith was the old man with the strange rooster, or was the bandit queen who carried off his vanished daughter and sold her into slavery. This is the establishment of similarity through identity. Each player selects one space on the board to be the station at which they start out (stations are represented by black circles). Players each choose a name for these starting stations from a list of the actual station names of Santiago’s underground. Each player also has a uniquely colored pawn that represents the their location in the Santiago Metro (the colored dot). No station in the game can ever sit within one space of another station, whether vertically, horizontally, or diagonally (even though players cannot move their pawns diagonally). This limits the number of stations that can ultimately be created in the game, which is important. Remember this when picking the locations for your initial stations. Players can move their pawns, in a straight or angled line, anywhere on the board, creating a “subway line” that follows the trail of their pawn. Lines cannot normally “branch” into multiple alternate lines, but must take the form of a single bending thread or a loop, just like most subway lines in the world. Pawns only move station-to-station, however, so wherever they stop becomes a new station if it isn’t already one, complete with a name chosen off the list. In the first example, below, the blue player moves their pawn north and creates a new station. Finally, the yellow player, though already sitting on a transfer station, moves parallel to the Red Line to join the blue player at the newly-built transfer station on the Red & Blue Lines. The yellow player could have made the same move by switching lines and traveling on the Red Line, but they decided to continue creating an extension of the Yellow Line. First, the blue player moves moves down the Red Line, traveling to what’s currently the “End of the Line” to the north-west. Players can travel on each other’s lines whenever they like, but can only travel on a new line if they begin their turn on a transfer station. This means, in a given turn, a player can only travel on a single subway line, though they are free to switch lines however they want between turns. However, note that players cannot establish stations on other players’ lines. They are limited to traveling between previously established stations. Next, the red player turns the Red Line into a loop by connecting up to the original station on their line. However, the red player chooses to bypass that station and the blue player who just moved there, since the red pawn doesn’t have to stop there to create a station, and continues down the Red Line to finally stop at the transfer station connecting to the Yellow Line. Finally, the yellow player moved north, bringing the Yellow Line along, and creates a station on a space where the Red and Blue Lines are moving in parallel. Because of the lines already in that space, the new station is now a three-way transfer between all three lines. Interestingly, Issues evolve as characters try to address them. What seems at first to be a simple problem, a momentary issue that a foreigner can easily step in and help with (someone’s choking! ), will undoubtedly end up drawing you into the grander mysteries of Transantiago. Issues evolve in the manner of traits in the Avatar game, where you keep track of the things characters did to attempt to address an Issue and, whenever the GM decides, alter the Issue a bit to reflect new developments. So, if a character finds an umbrella for the older gentleman, he will thank them profusely and then realize that he has a message that he needs delivered to a friend, a friend who lives… in a subway station that the characters have not even heard of (i.e. one that’s not even on the map yet). Right now, there are no resolution mechanics to decide how attempts to address an Issue are born out. I could leave it up to the whims of the GM, but that’s not all that interesting. This is, I suspect, the last core element of the game that needs to emerge before I’m ready to pull all this together and playtest it. As We Mourn the Ephemeral Beauty of This World of Suffering, Let Us March Out Dancing! Brilliant and beautiful. I’m going to try and put together a playtest of this. Question: You mentioned an Avatar game. What game is this? Do you have a link. Comment: I had an idea a while ago that I called “Campaign Transcendence” but I wasn’t really able to go anywhere with it. I think you definitely have something here with that. Brandon, the Avatar game is the top one linked in the sidebar on the right. Thanks for the comment. I’d be interested in seeing the notes for your project. Hituro: Yeah, the bits and pieces I’ve posted here don’t really fit together. I’ve been planning on getting a playtest draft together, but haven’t quite yet. I’ll definitely make an announcement when I do, though.